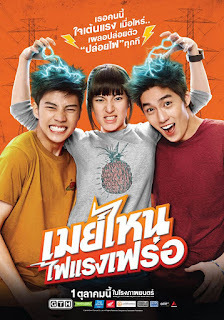 Teenage angst takes the form of electricity in the Thai teen romance May Nhai .. Fai Raeng Fer (เมย์ไหน..ไฟแรงเฟร่อ, a.k.a. May Who? ), which is about a schoolgirl who is afflicted with a powerful electrical charge, which she releases when her heartbeat reaches 120 beats per second. This makes it difficult for her to get close to anyone. Sutatta Udomsilp stars as May. She keeps a low profile at school in order to keep her shocking condition a secret, but her heart gets racing whenever she sees the star athlete Fame (Thanapob Leeratanakajorn). Her superpower is discovered by classmate Pong (Thiti Mahayotharak), a shy guy who also keeps to himself but has a crush on the school's most popular girl (Nareekul Katepraphakorn). So May agrees to help Pong score with his crush if he keeps her secret and helps her hook up with Fame. May Who? has movie studio GTH doubling down on the last few months of the year, as the film is being released less than a month after the studio's current hit Freelance. Usually the studio makes just two or maybe three films a year, and spreads them out more. Sure to also do well at the box office, May Who? is directed by Chayanop Boonpakob, a former indie filmmaker who got his big commercial break with the 2011 hit SuckSeed, about a teenage rock band. Along with the special effects related to the girl's superpower, May Who? also includes animated segments, inspired by notebooks Chayanop drew in when he was in high school. The new film has been accompanied by the usual promotional blitz by GTH, but it's been a bit awkward because talented young actress "PunPun" Sutatta has been suspended from working by the company after she and members of the cast of Hormones the Series misbehaved on a train while visiting Japan. They posted a clip of their rowdy behavior on social networks, not realizing that being disruptive on public transport is seriously frowned upon in orderly Japan. To prevent the breach in etiquette from becoming a major international incident, GTH made all involved issue apologies, and they punished PunPun and the others by banning them from social media and suspending them from work. And PunPun's suspension doesn't end until sometime next week, too late to support her new film before its release. You can read more about the movie in an article in The Nation. Next week is the third Bangkok edition of the Shnit International Short Film Festival, which runs from Wednesday until October 11 at the Lido multiplex in Siam Square. Now in its 13th year, the Switzerland-based Shnit fest is held simultaneously in several cities, with Bangkok joining Bern, Buenos Aires, Cairo, Cape Town, Moscow, San José and Hong Kong. The selection includes new short-film entries from around the world plus a special bloc of "Made in Thailand" shorts. Find out more at the festival's Facebook events page. Other new releases in Thai cinemas this week include the The Tribe, the troublemaking entry at Cannes last year. For more, please see the other blog.